Hollywood Stories is a fun book to read. 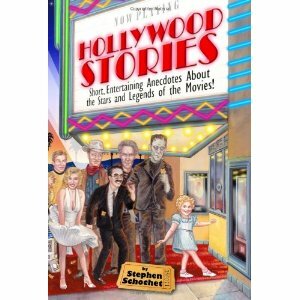 True to its title, it is chock-full of entertaining anecdotes about the stars and legends of the movies and TV shows. It is a backstage pass, so to speak, a window behind the scenes of the actors, directors, writers and producers that paint another picture of who they are. The author is never salacious and his stories are not conjured. He states that everything in the book is public domain stuff. He has gathered hundreds of these stories throughout the years and has made it handy for us through this book. Schochet’s writing style is engaging, funny and highly entertaining. Once you read a few tales, you don’t want to stop. Sometimes my hubby would pick up the book and refuse to give it back to me when I wanted to continue reading it. The stories are categorized into 13 different themes such as Oscar Tales, Great Hollywood Comedians and Walt Disney Stories. A handy index is available at the back to find those anecdotes you read and want to share. I learned so many interesting things about the movie-making business and that not all is as it appears. Here are some of the fun tidbits I enjoyed from these engaging short stories. Leonard Nimoy who played the original Spock in the Star Trek series was humiliated by and hated wearing his pointed ears and never felt appreciated by his bosses? Eddie Murphy, who replaced Sylvester Stallone after he walked off the film Beverly Hills Cop, ad libbed most of the dialogue since the original screenplay was mostly action scenes? He was so funny that his co-stars had to work hard not to laugh and ruin takes. The opening scene of The Sound of Music was shot from a helicopter whose blade force kept blowing Julie Andrews over so that she would spit out dirt and grass and then curse like a sailor? I got this book from the author who is also a professional tour guide in Los Angeles. As he gave us the tour he would entertain us with stories about Hollywood and movie stars, emulating Zsa Zsa Gabor’s accent, making our tour memorable. We saw first-hand how knowledgeable this author was and how much he enjoyed telling the tales. This book is the perfect gift for anyone who is a movie buff, especially those nostalgic of the classics. It’s a book that would sit well on a coffee table, in your car, at the office, or anywhere a reader could steal a few moments of fun reading. Learn more about this book and its author at www.hollywoodstories.com. Disclosure: Thanks to Stephen Schochet for giving me this book for review. I was not compensated in any other way, nor told how to rate or review this product. That sounds like fun! Beverly Hills Cop wouldn't have been the same without Eddie Murphy in it. Now I want to watch it again.